You are currently browsing the MSBLOG weblog archives for February, 2015. The Windows Firewall service must be started before Setup can continue. [2/16/2015 1:11:59 AM]  [ERROR] The operation could not be performed because object ‘exchserver01’ could not be found on domain controller ‘adserver01.domain.com’. [2/16/2015 1:11:59 AM]  Ending processing. [2/16/2015 1:11:59 AM]  [ERROR] The Windows Firewall service must be started before Setup can continue. You will need to remove the RUS manually. Most likely Exchange 2003 wasn’t decomm-ed properly (if you are no longer using Exchange 2003). 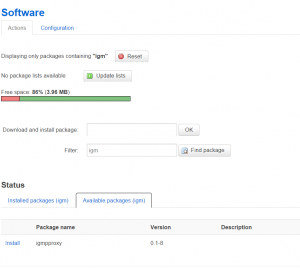 Just proceed with starting the Windows Firewall service and rerun the update of Service Pack. Remove the RUS (If you no longer have any Exchange 2003 server in your environment). Open ADSI Edit, expand Configuration, expand CN=Configuration,CN=<domain>, expandCN=Services, expand CN=Microsoft Exchange, expand CN=<Exchange organization name>, expand CN=Address Lists Container, and then select CN=Recipient Update Services. In the result pane, right-click Recipient Update Service (Enterprise Configuration), clickDelete, and then click Yes to confirm the deletion. By default, with Astro IPTV, you will be getting a Technicolor device from Maxis. I will show you how to replace the Technicolor and replace it with an OpenWRT router (I’m using “OpenWrt Barrier Breaker 14.07”). 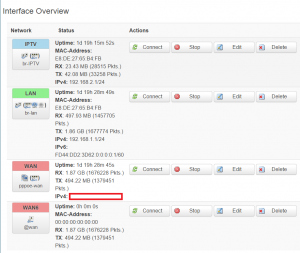 Ensure that your router is already flashed to the OpenWRT version. 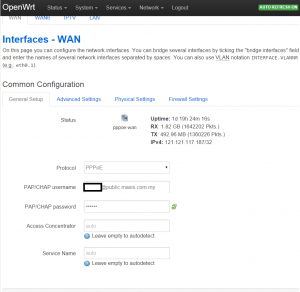 See this post if you have not done so: Installing OpenWRT. Change Password. 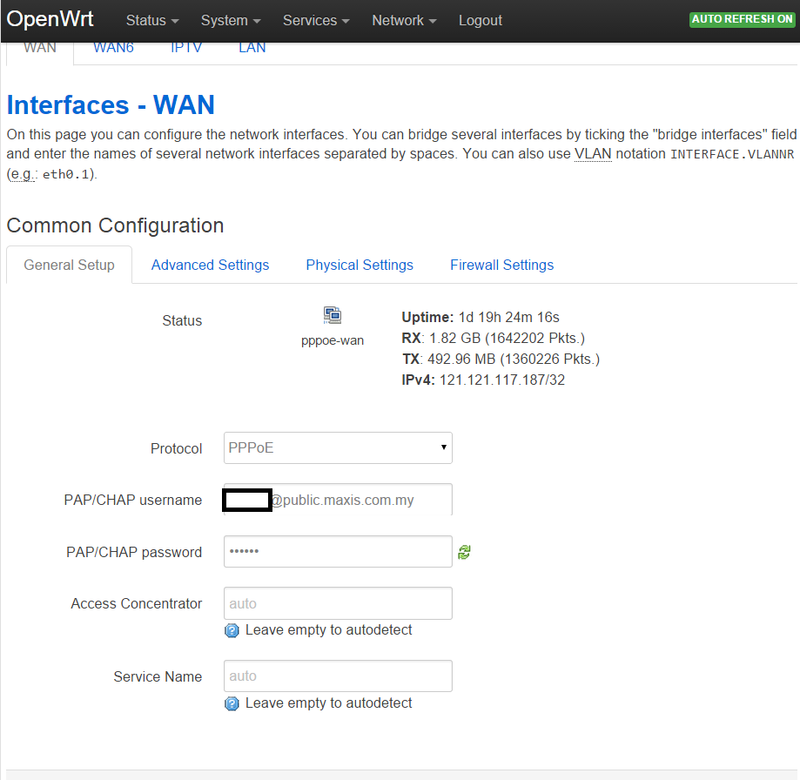 On opening OpenWRT router, you will be asked to login. 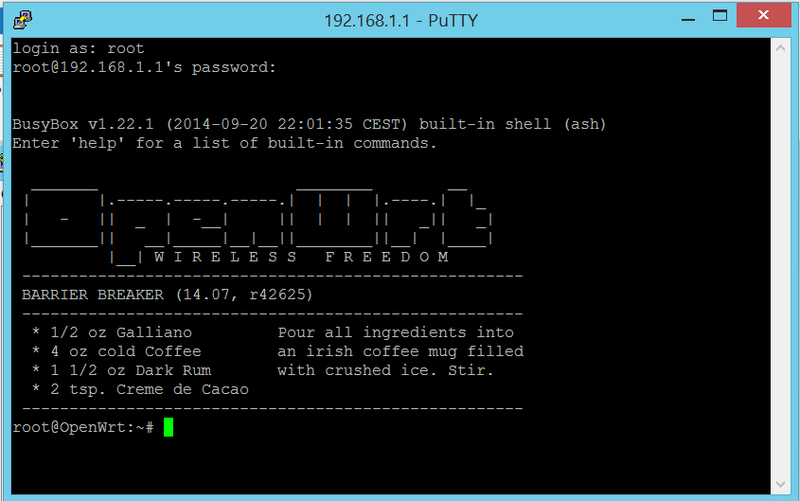 The default password for OpenWRT is empty. Login and change your password. Connect to PPPoE. 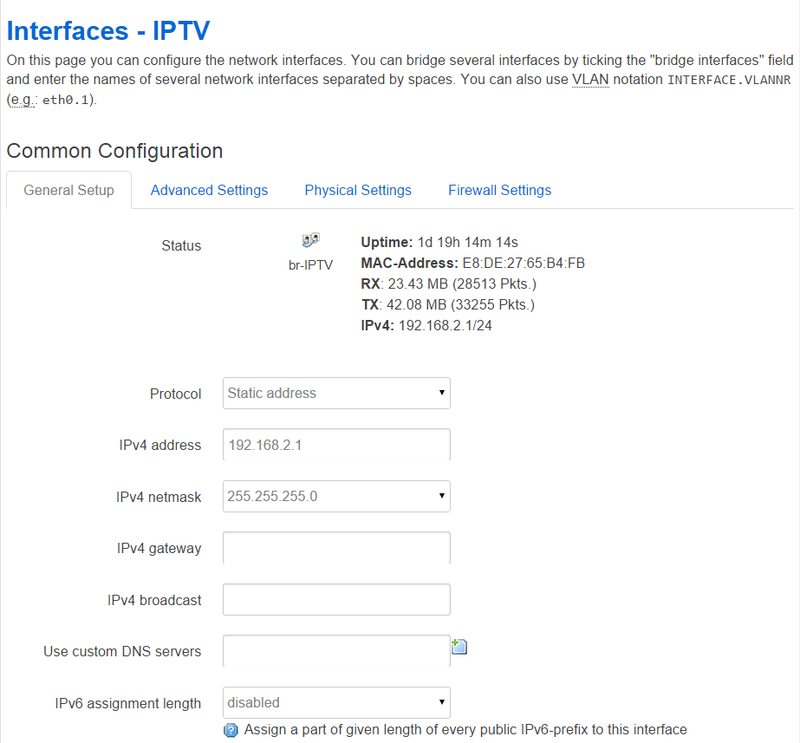 First thing you want to do is to connect to PPPoE, so your WAN will be able to connect to the TM fiber device. 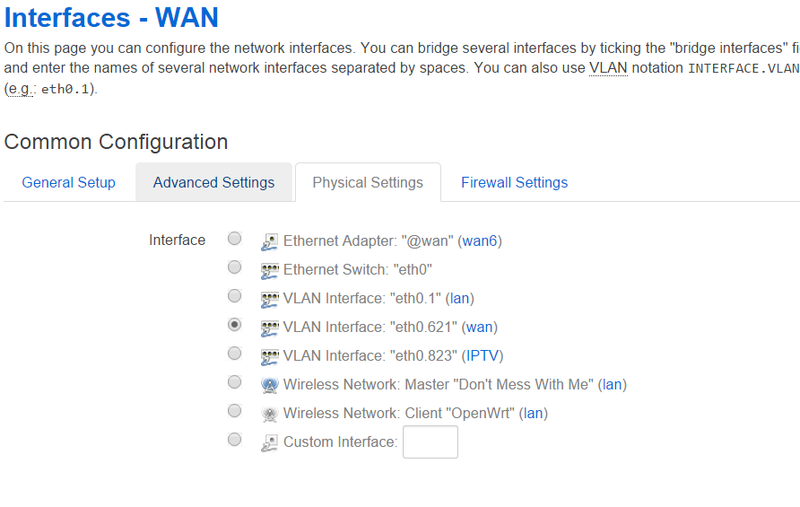 Click Network -> Interface -> next to WAN, click Edit. Change the protocol to PPPoE-WAN. Specify your username “5 digits@home.maxis.com.my or 5 digits@public.maxis.com.my”. Password by default should be the your 5 digits with a value 1 behind. Eg, if your username is 12345@home.maxis.com.my, your password will be 123451. Switch. Click Network -> Switch. 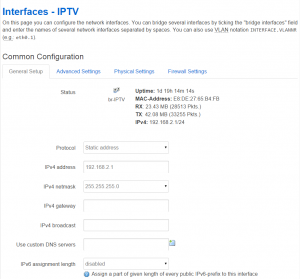 Under VLAN ID, modify the value 2 to value 621. 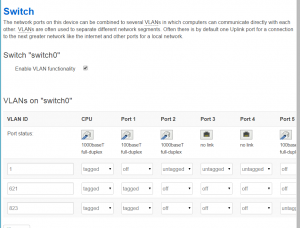 Port 1 by default should be your WAN port. Ensure that CPU and Port 1 both are set to “Tagged”. Leave the rest of Ports as Off. Click ADD. 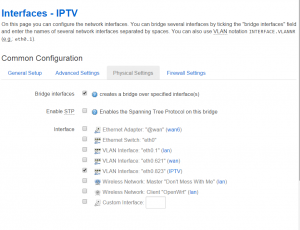 Change the VLAN ID for the new VLAN Interface to 823. 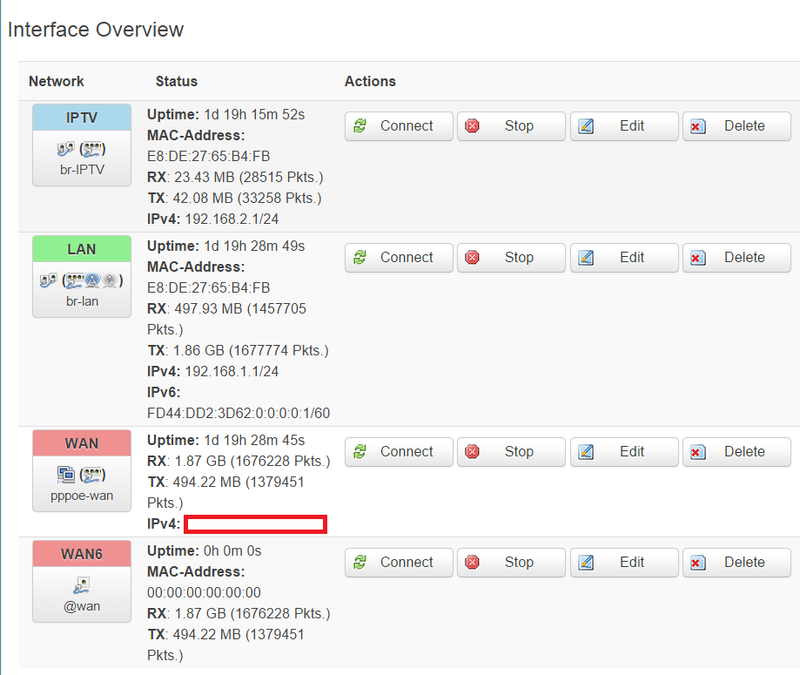 With your Astro IPTV decoder plugged into your router’s Port 4, it should be then Port 5 in the OpenWRT Switch interface. 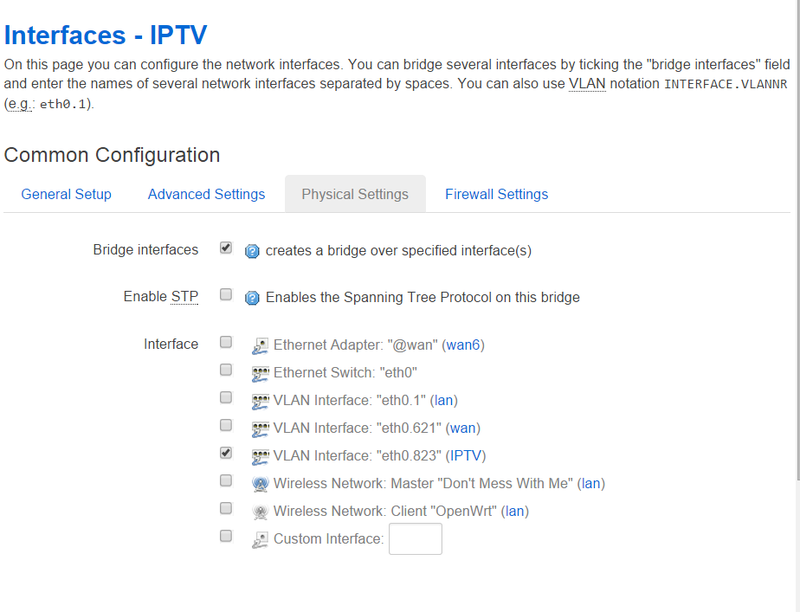 Under VLAN ID 823, ensure that CPU, Port 1 both are “Tagged”. For Port 5, set it as “Untagged”. Rest set as Off. 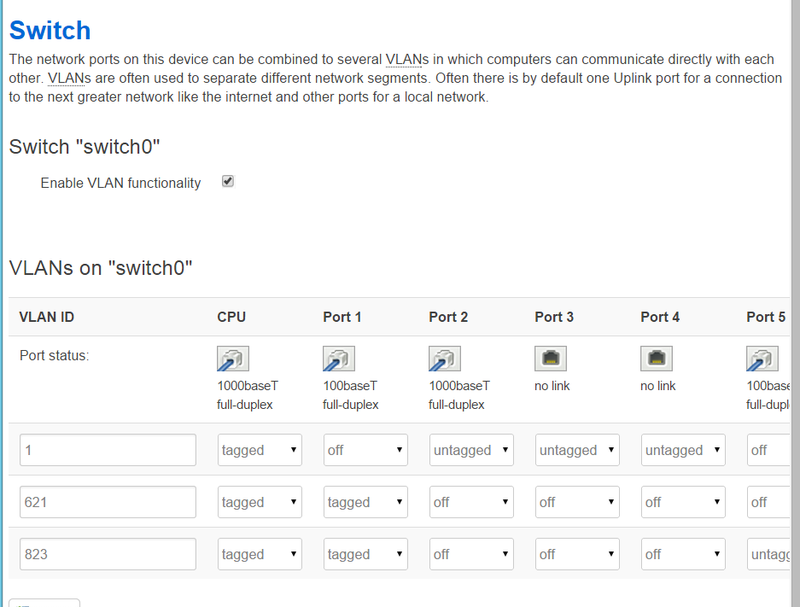 Under VLAN ID 1, turn off the tagging for Port 5. Go to Network -> Interface. Under Interface, DHCP Server, click “Setup DHCP Server”. Under DHCP Server, click “Advanced Settings” tab. Ensure that “Force DHCP on this network even if another server is detected” is selected. 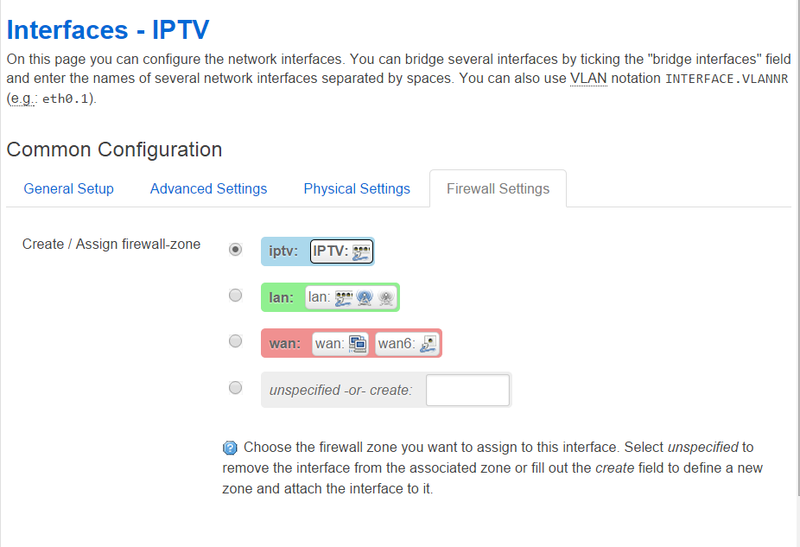 Network -> Firewall, under IPTV, select the Edit icon. 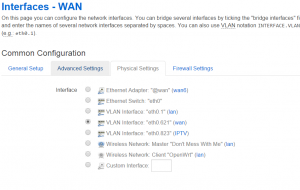 Ensure that “Allow Forward to destination zones” is selected for WAN. click Available Packages. Click Install next to IGMPPROXY. Under Login As, type “root”. Press Enter. Type in your OpenWRT password.